We have strategically scheduled this workshop to coincide with the annual salmon runs at Lake Clark National Park. As a result, Grizzly Bears are plentiful. People are not. In fact, the lodge and surrounding land is privately owned. You will not be struggling for position with throngs of tourists like in other well known bear congregation areas found in Alaska. If you appreciate peace and solitude while utterly encompassed in Alaska’s natural bounty, then this is the place for you. 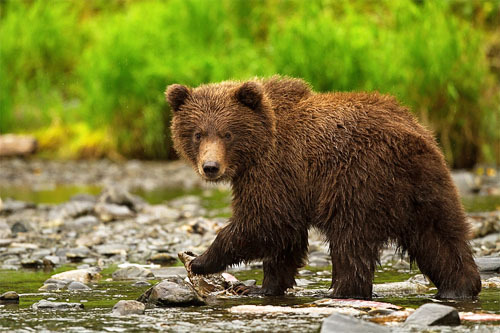 Fantastic opportunities to photograph bears as they fish for salmon, dig for clams, forage on grasses as well as cubs nursing, running and playing are high. Furthermore, at this time of year in Alaska, the daylight hours are long, very long. It’s not uncommon to spend 12 hours in the field shooting, especially if the action is nonstop. Rest assured, we are there to put you in the right place at the right time with the best light possible. We will be working alongside you, guiding and advising you on wildlife technique, equipment, settings, exposure and composition as much or as little as you desire. You are the client and this is something we never forget. However, This is not the workshop for you if you are only interested in a few quick snap shots and then retiring to the lodge. Our goal is to get you professional quality images worthy of publication or gallery quality prints and that often takes concentration, patience, and plenty of field time. Day 1 – Our adventure will begin in Anchorage, Alaska where we will meet our chartered plane in the morning and begin our short flight to our comfortable lodge located within the beautiful Lake Clark National Park. First established in 1980 to protect the vast scenic beauty (volcanoes, glaciers, rushing rivers, spectacular waterfalls, and vast assemblages of marine and terrestrial wildlife), Lake Clark National Park and Preserve provides an unparalleled wilderness experience. In fact, there are no roads to the lodge. It is only accessible by air or sea. Due to the heavy concentration of bears during this time of year, its highly likely we’ll see our first Grizzlies before we even land the plane. After our orientation over a hearty lunch, we’ll prepare our gear and head out into the field in search of our first Grizzlies. We will use ATV’s and highly experienced local guides to seek out our exciting subject matter. Although the terrain is expansive and the bears tend to spread out, in all likelihood, we won’t have to search long. Once located, we will safely approach our subjects on foot. Both your guide and photography instructor have worked extensively with Grizzly Bears and will utilize their knowledge and experience to maintain an optimal working distance that ensures both safety for bears and people as well as outstanding imagery. With the exception of timely breaks for wonderful home cooked meals and a bit of rest time, our day will be devoted to seeking out amazing Grizzly Bear imagery. Day 2 & 3 – A continuation of the theme, with some flexibility due to weather and the tides. We will be working to get you professional quality images of not only the Grizzly Bears (for which there will be plenty of opportunities) but also other wildlife we happen to come across. 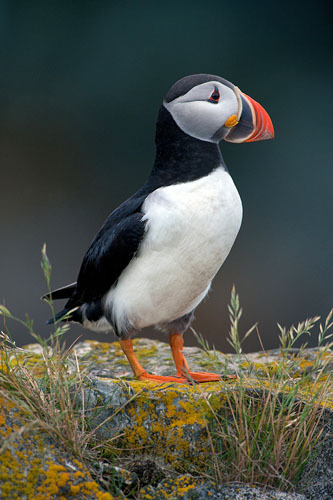 We will also keep an eye out for various marine mammals including whales and dolphins that frequently inhabit the local waters, eagles and other bird species (such as Puffins), and if we’re lucky, wolves, black bears, fox and other predators. Depending on shooting conditions, we will most likely take a break at some point in the day. 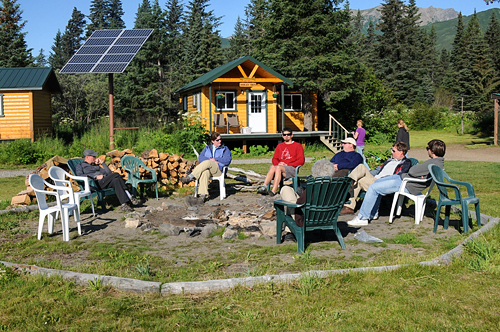 As mentioned, summer daylight hours in Alaska are long (18 hours plus). The home cooked food is phenomenal, plentiful and not to be missed. Local, fresh ingredients (fresh salmon, halibut and other seafood, home grown vegetables, fresh berry pies, homemade breads, cookies and muffins etc..) are often a central focus for the meals. During downtime, aside from relaxation, time will always be allocated for image review, critique and Photoshop post processing techniques to bring out best in your images. Day 4 – We will continue photographing the Bears during the extended morning hours and wrap up with a hearty brunch back at the lodge. Our charter plane is scheduled for a late morning pickup, weather permitting and transport us back to Anchorage. Although the workshop will officially end once back in Anchorage, we highly encourage you to explore more of Alaska if you have the time. Alaska is a magnificent state with so much to offer the nature and photo enthusiast. Anchorage is a great starting place. We will be staying on-location in semi-rustic but very comfortable lodging. Double occupancy rooms. Although we are located in the remote Alaskan wilderness, it doesn’t mean we have to rough it. Modern conveniences are always available. Hot showers, wood burning stoves, full bathrooms, a sauna, full kitchen facilities, comfortable meeting rooms, electricity via generator, digital projectors, power outlets for charging, etc.. Best of all, the scenery outside our doors is truly spectacular. We are in the middle of wild Alaska. Bears and Bald Eagles are our neighbors, not people.